It’s the holidays and for many it’s a time filled with cheer and family and good times. But for others this a time is of lonliness, isolation and worries about the future. How can we change that? What can we do to help us cope with and modify these feelings and get to a more positive space? 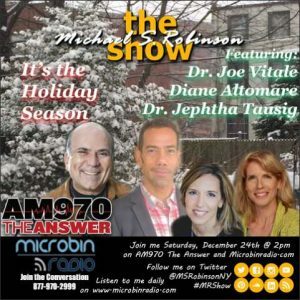 This week Michael Robinson leads a discussion on just what we can do to move in this direction with his special guests: author and speaker Dr. Joe Vitale; life coach Diane Altomare; and clinical psychologist Dr. Jephtha Tausig. And as an added treat May Cheung is here with some Christmas tunes!